Typical Uses: Biking, Hiking, Surfing, Etc. This Waterproof HD Action Camera boasts some impressive features. Capable of 1080p recording, your videos benefit from true HD quality and with an ultra-wide 175 degree angle, you're guaranteed to capture all of the action. Mount it wherever you like. It has accessories for every kind of mounting and can be used in any condition where where is wind, dust, snow and mud since it fully protected in its shake-proof and quake-proof housing, making it ideal for all extreme sports. Records HD quality video and photos. As well as shooting HD video, the camera can also take 5.0 mega pixel still images. 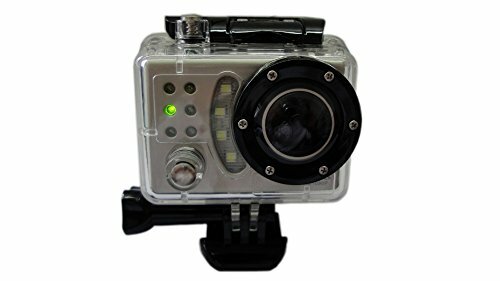 The camera includes an IP68 waterproof housing that provides extra protection to the camera and lens, while also allowing the camera to be used underwater up to a depth of 30 meters. Die-cast protective casing makes this camera perfect of using while participating in any sporting activity. Wide-angle lens designed to capture everything that is happening around you.